What are Homes Selling for in Greater Cincinnati? 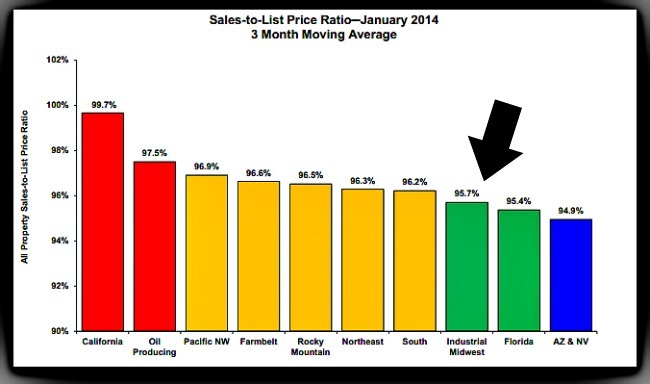 The “Campbell/Inside Mortgage Finance- Mortgage Finance” released results for January and the ratio of the sale price to actual list price for residential property in the midwest is 95.7%. 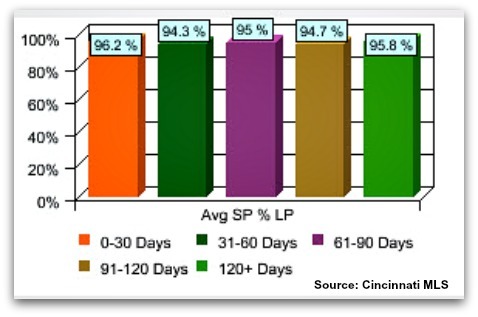 The greater Cincinnati market is slightly below the average for the “Industrial Midwest” coming in at 95.49% sale price to list price ratio. The difference is not great and our area is at the southern edge of the Midwest and probably felt the impact of our winter more than the cities in the north. You know how Cincinnati comes to a halt after a few snow flakes. Sellers have had to make lots of adjustments since January as the number of new listings bloom and sell quickly or begin to sit on the market hoping for a buyer. Lots to think about -but it’s a well know fact-the quicker a property sells the higher the sale price. The average seller with a $200,000. property selling within 30 days of listing nets an average of nearly $4,000 more than the seller who sits on their property for 31-60 days. So if you’re a seller and have found your next property – is it worth overpricing your home/condo today and taking a chance of losing $4,000 plus the property you would like to purchase?